Note: This feature is currently only available to U.S. customers. 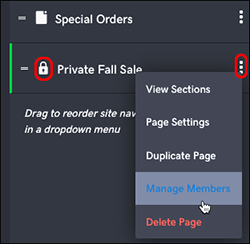 Also, you cannot add members until after you create at least one private page. Members will have access to all of your site's private pages. Select the upper-right Pages panel and find an existing private page (it has a lock). Select the three dots to the right of the page's name, and select Manage Members. In the separate Connections page that appears, select Add. Fill in the fields in the Add individual tab. 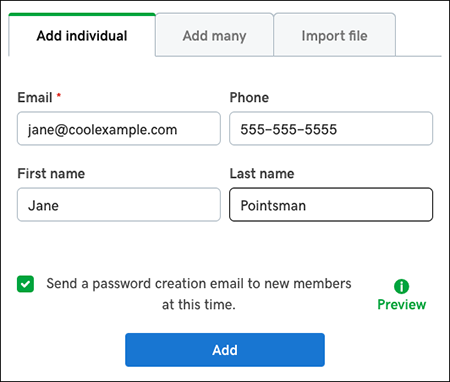 A new blank Add individual form appears if you want to add another member. When you're done, close the window by selecting the X in the upper right, and you'll see your list of added members. Note: The Contact type column marks members with a dark head-and-shoulders icon. How to add more languages on one site?